When it comes to SUVs, two names that have featured prominently in the segment’s expansion are Volkswagen Touareg and Jeep Grand Cherokee. Both names embody the meaning of SUV — they work well in and around the city, while also remaining fairly capable off the beaten track. With a starting price of just under $70,000, these two SUVs represent a curious position in the market. They’re only available with five seats and cost considerably more than the rest of the five-seat SUV pack. The price premium is redeemed on the towing front, however. Both vehicles offer an impressive 3500kg braked towing capacity, which is only matched by more expensive SUVs, or in the case of the Y62 Nissan Patrol, one that is only available with a petrol engine. We saddled up and hit the road to figure out which of these two offers the best value for money and most importantly, the best drive. Starting from $67,990 (plus on-road costs), the Touareg 150 TDI is the most affordable of the two. 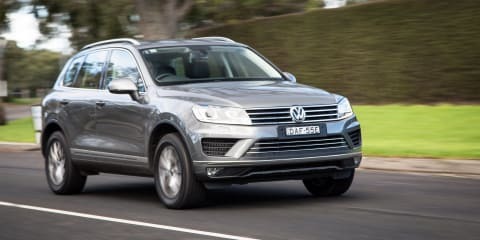 Available only as a diesel, the Touareg range comes in 150 TDI trim, V6 TDI and V8 TDI, with the more expensive V8 TDI costing an eye watering $114,990 (plus on-road costs). To simplify things, there’s only one option available with the Touareg. The metallic paint pack costs $1500 and is a mandatory option on the six available colours unless you tick the solid white option box. The standard features list is quite impressive and includes items like: 18-inch alloy wheels; an eight-speaker sound system with MP3, Bluetooth streaming and CD player; dual-zone climate control; nine airbags (including driver’s knee airbag); rear-view camera; rear parking sensors; eight-inch colour infotainment touchscreen with inbuilt hard disk; satellite navigation; LED daytime running lights; electric seats for the front row; electronic differential lock; active bi-xenon headlights; electric park brake; leather seats; automatic windscreen wipers and automatic headlights. Powering the Touareg is a 3.0-litre six-cylinder turbocharged diesel engine that produces 150kW of power and 450Nm of torque. It consumes 7.2L/100km on the combined cycle and does the 0-100km/h dash in just 8.5 seconds. Torque is sent through an eight-speed torque converter automatic gearbox. In terms of off-road equipment, the constant all-wheel drive system (4MOTION) pairs with an ‘off-road’ mode that adjusts throttle response, gearbox shifts and stability control intervention. Upper models are available with air suspension and adaptive dampers. The Jeep Grand Cherokee Limited on the other hand starts from $69,000 (plus on-road costs). The Grand Cherokee range is far wider ranging with both two- and all-wheel drive versions and petrol and diesel engines on offer. 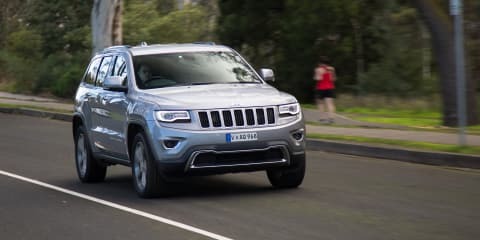 The range starts with the two-wheel drive petrol Laredo at $47,000 (plus on-road costs) and caps out at with the Grand Cherokee SRT at $90,000 (plus on-road costs). Unlike the Touareg, the Grand Cherokee is available with a few more options. Buyers can opt for premium paint (which costs $650 and is available with all nine colours, except the solid white), perforated and ventilated leather seats ($700), an off-road package that adds a limited slip differential and skid plates ($1950), a rear seat entertainment system ($2500), a dual-pane electric sunroof ($3250) and Quadra-lift air suspension ($3250). Standard features include: 20-inch alloy wheels; nine-speaker sound system; electrically adjustable steering column; dual-zone climate control; seven airbags (including driver’s knee airbag); rear-view camera; front and rear parking sensors; 8.4-inch infotainment system with DAB+ digital radio; LED daytime running lights; front row electrically adjustable seats; steering wheel-mounted paddle shifters; satellite navigation; automatic headlights and windscreen wipers; bi-xenon headlights; first and second row heated seats; keyless entry and start; power tailgate and electrically-assisted steering. Under the Grand Cherokee’s bonnet is a 3.0-litre turbocharged six-cylinder diesel engine that produces 184kW of power and 570Nm of torque. Torque is sent through an eight-speed automatic transmission with full-time four-wheel drive. On the combined cycle, the Grand Cherokee consumes 7.5L/100km of fuel. Unlike the Touareg, the Grand Cherokee comes with a proper low-range transmission. There are also several off-road modes that tailor the vehicle’s stability control, throttle and gearbox to enhance the driving experience. The modes include automatic, sand, snow, mud and rock. Serious off-roaders can option the off-road adventure group, which adds a 230mm rear axle, an electronic differential lock, along with a host of underbody protection for $1950. As you set foot in the Volkswagen, it feels like a step back in time — albeit only a brief one. The interior is dated compared to the rest of the Volkswagen range, but it remains functional, clean and easy to use. The eight-inch infotainment screen is Volkswagen’s RNS510 system, which features satellite navigation, an inbuilt 30GB hard disk, along with a colour touchscreen. Looking around the rest of the cabin, it looks and feels very well built. It doesn’t feature some of the cost-saving plastics used in a number of modern SUVs and the doors close with a confidence-inspiring thud. The switchgear and buttons are conveniently located and easy to locate. Despite the lack of some modern features, the infotainment system is fast and responds quickly to inputs. The sound system is also a cracker, featuring eight speakers, plenty of bass and excellent high frequency clarity. The cabin contains a number of storage spaces, along with an air-conditioned glove box. The Touareg also still features the characteristic keyhole to the left hand side of the steering wheel. Both front seats are electrically adjustable and offer plenty of side and bottom bolster. In fact, they are incredibly comfortable, especially over long distance journeys. The seating position is excellent, with all switchgear within easy reach. The steering wheel sits nicely in hand with plenty of room for circular movements about the wheel. Sometimes in SUVs like this, the centre console can get in the way of some steering motions. Second row shoulder and knee room is very good. It would be a stretch fitting three adults abreast in the second row in both cars, but two is a comfortable fit. Legroom is better than the Grand Cherokee, but can be a little limited at times. It’s also easy to catch the B-pillar when getting in and out, but practice makes perfect. Rear seats can be conveniently folded 60:40 via a release in the boot, making loading luggage an easy task. There are also two ISOFIX points located on the outer seats. Cargo capacity is where these two differ greatly. The Touareg offers 580 litres of capacity with the second row raised, which increases to 1642 litres with the second row folded. The Grand Cherokee on the other hand delivers 782 litres with the second row in place and 1554 litres with the second row folded. In terms of spare wheels, the Touareg comes with a space-saver spare tyre, while the Grand Cherokee comes fitted with a full-size spare wheel. Over in the Jeep, the ambience is totally different. The cabin feels bigger and more modern. Jeep uses an 8.4-inch infotainment unit that features a colour touchscreen, inbuilt hard disk storage and a host of extra features. Grand Cherokee Limited drivers get a heated steering wheel, in addition to seat heating in the first and second rows. There’s also a modern satellite navigation system and an LCD screen that sits further back that between the tachometer and speedometer. While the cabin feels a little more cavernous, it doesn’t feel as premium as the Touareg. The finishes are cheap in some areas, while some controls are hidden in menus. The second row is more cramped than the Touareg with a distinct lack of leg and toe room. It’s also a little tricky to get in and out with the B-pillar sometimes getting in the way of things. Two sets of ISOFIX points are located on the outer two seats, with the second row offering 60:40 split folding. Over a longer distance drive, we found the driver and front passenger seats to be a little firm. The Touareg seats hug you nicely, while the Grand Cherokee seats are flat and firm, meaning there is movement through corners and a lack of support for longer journeys. The Grand Cherokee comes with keyless entry and start, but the Touareg still requires the key to be used for entry and start, which feels a bit behind the times. We also found the lack of power tailgate in the Touareg a little frustrating, given its price tag — it’s fitted as standard on the Grand Cherokee. As we hit the road, both cars started to show their true colours. The Touareg’s engine turns over quietly with a silent rumble audible inside the cabin. Even from the outside the Touareg is quiet and doesn’t sound like a traditional diesel vehicle. The eight-speed automatic gearbox perfectly complements the engine with smooth gearshifts and quick kick downs on command. Throttle response is good, but can be a little delayed when called upon on the move while the gearbox and engine sorts itself out. From a standard start it’s quite responsive. In gear response is excellent with the full complement of 450Nm delivered confidently. As the revs rise, the Touareg actually emits a meaty engine note that is uncharacteristic of a diesel. It’s quite impressive and is welcomed with each dab of throttle. Steering feel is absolutely spot on, as is the ride. While the entry-level Touareg doesn’t get adaptive dampers, it is compliant over choppy surfaces and deals well with potholes and sudden changes in road quality. While neither of these vehicles set the world on fire in terms of handling, it’s the Touareg that offers the most confidence inspiring drive. The body remains fairly flat through corners and the 4MOTION all-wheel drive system does a commendable job of continuously shuffling torque between the axles. Of the two, the Touareg is the lightest, weighing in at 2146kg, while the Grand Cherokee comes in at 2281kg. It’s certainly the sportier of the two and feels the most car-like to drive. This is also helped by the excellent visibility out the front and rear. We did take issue with the low-quality rear-view camera, though, which is blurry and almost pointless at night. The experience in the Jeep is completely different. As the Jeep turns over, it idles loudly and offers a minor vibration through the chassis. It certainly sounds more like a traditional diesel and is louder than the Touareg both at idle and during operation. While there has been some confusion with the gear shifter, we found it fairly easy to use with lights on the gear shifter indicating the gear with a secondary indicator on the dashboard. It’s disappointing to see the Jeep still uses a foot-operated park brake, unlike the Touareg’s electric park brake. It’s one of those cumbersome things that makes the Grand Cherokee feel much older than it actually is. As we hit the open road and departed the smooth highways, the Grand Cherokee’s ride felt firmer than the Touareg and didn’t feel as compliant over poor surfaces. It sometimes crashed over bumps and didn’t feel as well planted. One of the most obvious downfalls was the steering. The electrically-assisted steering system lacks feel, with the steering rack much slower than the one in the Touareg. The Grand Cherokee requires 3.5 turns lock-to-lock, while the Touareg is almost a full turn less at 2.63 turns lock-to-lock. That means that the Grand Cherokee requires more steering input to achieve the same turn radius. This is most noticed when parking or during tight turns. While the engine offers a load of torque, there is noticeable turbocharger lag before that torque is delivered from a standing start. But, to its credit, it’s delivered in spades during overtaking and when the car is in gear and within its torque band. It’s curious to note that the Volkswagen Touareg was only crash tested back in 2004. It scored a five star adult occupant rating when tested, but has never been tested since. The Grand Cherokee on the other hand scored a five star ANCAP crash test. Both vehicles come with a three year warranty. The only difference is in the included mileage, with the Grand Cherokee offering three years or 100,000km and the Touareg three years and unlimited kilometres. On the servicing front, Volkswagen offers capped price servicing for the first six services of your vehicle. The Touareg tested here requires servicing every 12 months, or 15,000km and over a period of six years would cost $3621. Jeep on the other hand requires the Grand Cherokee to be serviced every six months, or 10,000km. Jeep doesn’t offer capped price servicing, but does outline the cost for the first 36 months of services (six services). The total cost over a three year period is $3238.32, making it more expensive to service than the Touareg, despite the shorter service intervals. Despite how long the Touareg has been on the market without significant change, we were surprised how easy it was to live with and how enjoyable it remained to drive. It puts the ‘sport’ in SUV and remains a great car to look at and drive. We’re excited to see what Volkswagen can do with the new model, which we expect to hear more about next year. The Grand Cherokee remains a good value for money proposition when you consider its towing capacity and features. But, it’s ultimately let down by an average driving experience. In the interim, great deals can be had on Touareg, so make sure you have an overnight drive to see if it’s the premium-ish SUV you’ve been looking for.